Use Build warnings parser tasks to scan build logs and output files for compiler warning. Warnings are aggregated into a build artifact and the summary of the warnings is displayed in the build result page. In you job configuration scree, click the Tasks tab. From the Builder type group, select Build warnings parser. Type of parser used by the task. Pick the one that matches the compiler (or other tools) used in previous steps of the build. Warnings can be associated with a repository containing your sources. This information can be later to used to notify the source control system about the amount and severity of warnings found by this task. By default, the warnings are linked to the default repository of the build. Pick the correct source repository to associate the warnings with. Where Bamboo should look for warnings. You can choose between parsing the output logs (default) or the file matching a glob pattern. A glob pattern defining which files should be scanned for compiler warnings. Switch this option of causes build to fail if number of warnings exceed defined threshold. The severity level of warnings counting towards build failure threshold. There are 3 severity levels: low, normal and high. If number of warnings (taking into account their severity) exceeds this number the build fails. 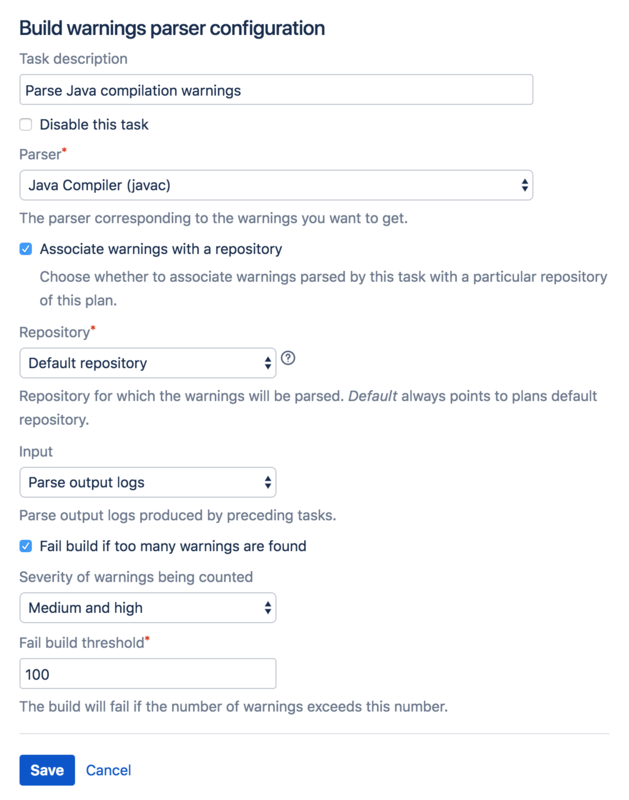 Example of a Build warnings parser task configuration.